If you’ve ever wanted to see some of the best street art in Britain you’ll be pleased to know that Glasgow has an array of murals painted across its city centre buildings that showcase a wide range of Scottish talent, and they’ve become highly regarded for their interpretations of the city’s heritage and culture. These murals have been designed to transform the less attractive corners of Glasgow into striking public artworks, and a walk between each one allows visitors to see parts of the city centre that they probably wouldn’t otherwise find. The street murals have also helped to rejuvenate many of the vacant sites in the city by bringing a splash of colour into areas that would otherwise be forgotten about and it’s great to see a city like Glasgow proudly displaying its sense of fun and quirkiness with these enormous art installations. The walk shown here visits the most impressive murals in the city centre, and the entire route is easily accessible on foot. Note that the artworks are designed to reflect the developing city so as the buildings are upgraded or demolished some of these murals will either be altered or lost forever, so re-walking the route a year or so later might show some interesting changes. 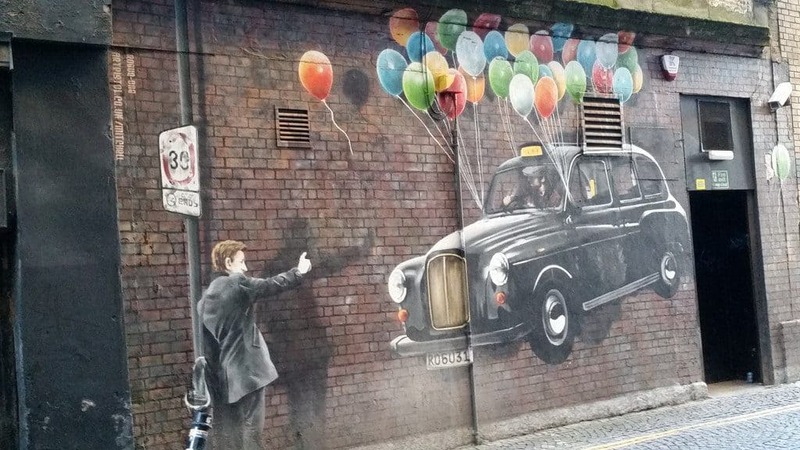 Following the Glasgow city centre mural trail will take you on a voyage of discovery around the city and it’s a great way to experience its culture while learning a little bit about its history and people. Credit has to be given to Glasgow City Council for allowing these enormous installations to be painted onto so many unlikely ‘art galleries’ and they really bring the buildings alive in areas that are a bit run down. The quality of the paintings is impressive – as is the size of the things – so if you’re intending to follow the trail I highly recommend you take your camera with you because you’ll be presented with umpteen photo opportunities as you make your way to each artwork. About an hour, depending on fitness level. Bear in mind that you will likely stop several times to view the murals, so plan for longer. Easy. The trail runs through the city centre and is accessible by well-maintained modern roads and footpaths. Starting at the Hip-Hop Marionettes mural on George Street, follow the road east towards Strathclyde University for the next mural. Then double back and head south down Albion Street, and turn south onto Candleriggs for the Badminton mural, just off the junction of Wilson Street. Head back to Candleriggs and continue south where you’ll find the Spaceman mural off the junction of Trongate. 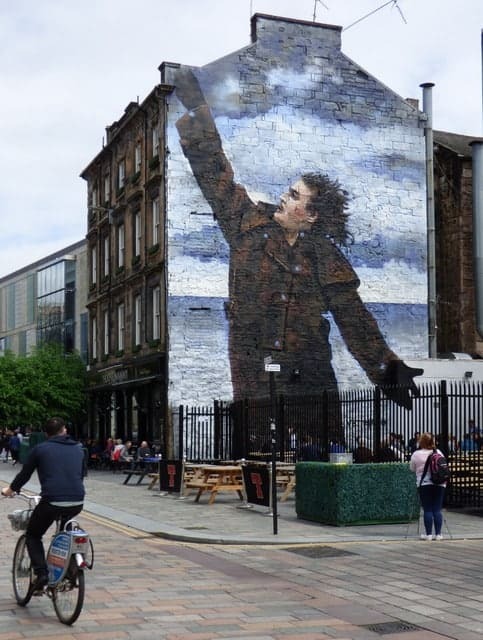 Heading back to Candleriggs, follow King Street south towards the River Clyde, where you’ll find the Clutha mural on Bridgegate. 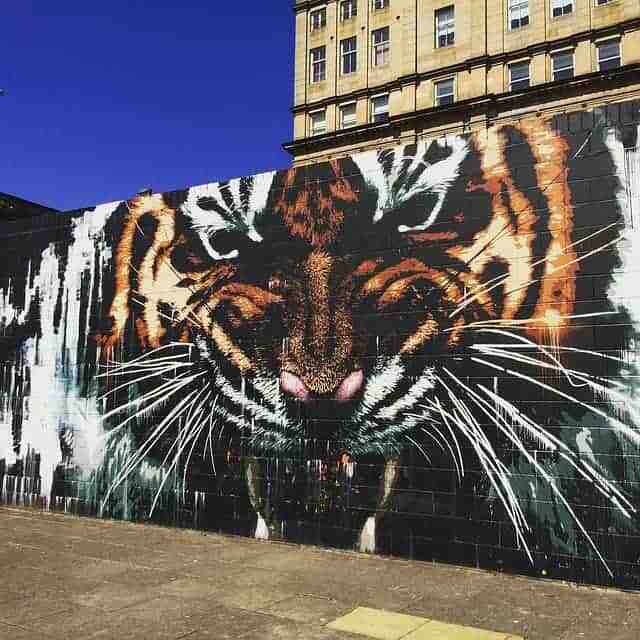 A walk west along the river bank will take you to the Tiger mural, where you can then head north up Dixon Street until you reach Argyle Street for the last two artworks. Either head east to the Argyll street Cafe mural, or head north up Mitchell street to the taxi mural, which is the last one on the trail. You can follow the route in the google map below or you can head on over to the Glasgow City Centre Mural page and download a pdf file which details all the murals along the trail with information about the artist and nearby attractions you might like to visit.